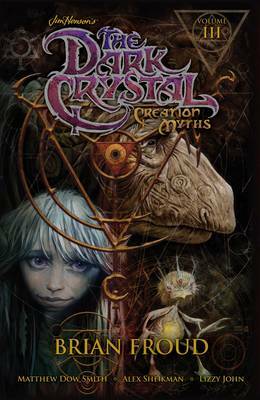 Brian Froud, legendary conceptual designer of the beloved Jim Henson fantasy film The Dark Crystal, returns to the world he helped create in this stunning conclusion of the official prequel to the original movie. The world of Thra is shattered. Following the events of the Great Conjunction, the once-powerful Urskeks have been split into two separate beings: the Skeksis and the Mystics. Only Raunip and Aughra know their true origins, but they are trapped in the bowels of the world of Thra, searching for the shard of the Dark Crystal. But as the aftermath of the Great Conjunction wreaks havoc upon the Gelfling tribes, the Gelfling may have no choice but to rely upon the one race offering aid: the Skeksis. The species of Thra will have to decide who they can trust if they hope to keep their world together. Written by Matthew Dow Smith (Doctor Who, X-Files) and gorgeously illustrated by Alex Sheikman (Robotika) and Lizzy John (Fraggle Rock), this third volume is the epic conclusion to the Creation Myths saga and also features behind-the-scenes photos and concept sketches from The Jim Henson Company Archives documenting how creature and puppet designs that never made it into the film were adapted and brought to life on the page.